Your dreams are the pictures of the future. Your Dream is the ticket to the great life you have always imagined. It is the map for the realization of the master plan. It is the blueprint for the execution of the grand design. Almost everyone has a dream; but not everyone has got a goal.A goal is usually a dream with a time line. When you have a dream, it is very important you stay true to the dream, because many times, a lot of forces militate against the achievement of your set goal. Winds, Oceans, Strong winds and Rivers...Through it at all we need to be tough and strong until we reach the finish line. You need to be bold and fight hard at everything that would try to stop you from achieving your dreams. Stand up and Make it happen, you dreams are God's gifts to you and you owe your world all it takes to make it happen! 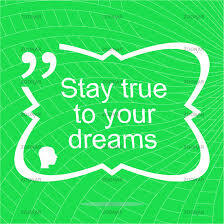 If you stay True to Your Dreams and Never ever give up, your wildest dreams will come to pass.